Heat oven to 350°F (325°F for dark or nonstick pans). Place paper baking cup in each of 24 regular-size muffin cups. Make and bake cake mix as directed on box for 24 cupcakes. Cool in pans 10 minutes; remove from pans to cooling rack. Cool completely, about 30 minutes. Tightly wrap 12 cupcakes; freeze for a later use. Stir blue food color into frosting until blended. Frost remaining 12 cupcakes with frosting. Cut six 1 1/2-inch pieces from fruit snack roll; peel off paper backing. 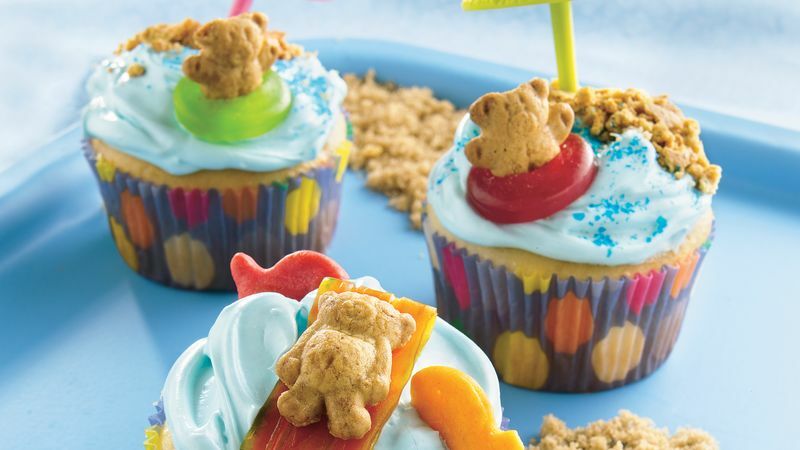 Use fruit snack and remaining ingredients to decorate cupcakes as shown in photo or as desired. If you have Betty Crocker® decorating icing (in 4.25-oz tubes), use the writing tip to pipe swimsuits on the bears.